Swaddling newborn babies has been used for generations. It is thought it recreates the feeling of being in the tight confines of the womb. It is therefore used to pacify and calm down the newborn by making them feel more secure. Due to the confined space it also stops the moro reflex. (startled reflex), although doctors are now warning that wrapping your baby too tightly can have long lasting health effects. It is therefore important that you swaddle your newborn correctly to allow movement. Many cultures wrap their babies very tightly and this has seen an increased incidence in hip dysplasia or dislocated hips. This is due to the ball and socket joint being prevented from developing naturally. The natural position for a newborn is “frog-style”, with its legs drawn up and abducted outwards. Therefore by swaddling the baby tightly, with its legs straightened downwards, the natural development is altered. It is also thought that breastfeeding your baby when swaddled tightly can lead to effective suckling. Many women swaddle their baby when breastfeeding as they think it calms them down and feels easier, but babies bond and explore which aids latching. Therefore if you want to wrap your baby when feeding, keep one arm out of the blanket. 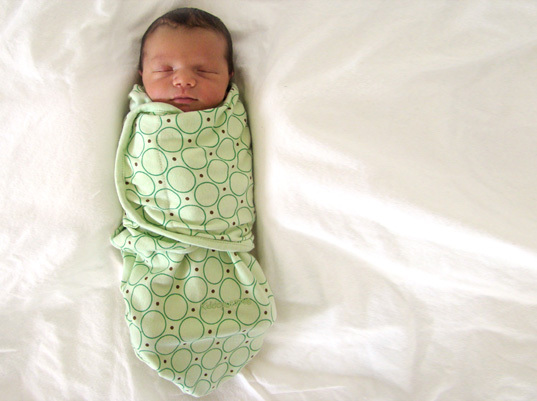 The Foundation for the Study of Infant Deaths (FSID) suggests that swaddling may be a risk factor for cot death. This may be due to the baby becoming overheated when swaddled. Therefore caution must be used and recommendations followed. There is also a concern that tight swaddling may increase respiratory illness. Probably due to constricting the chest and not allowing the lungs to expand to full capacity on inspiration. And babies should never be swaddled and placed on their side or stomach. In fact if babies are placed prone, they should be supervised at all times. 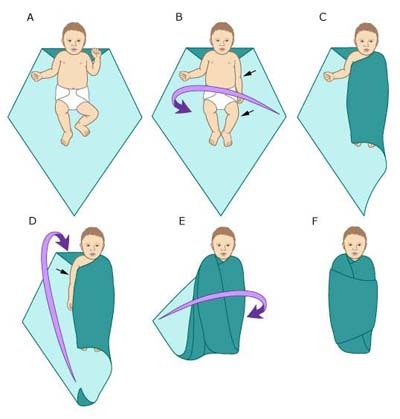 · Current research suggests that it is safest to swaddle infants from birth and not to change infant care practices by beginning to swaddle their infant at 3 months of age when SIDS risk is greatest. · Secondary care givers should be made aware of their infant’s usual sleeping environment and practices. If you do want to swaddle your newborn, don’t use heavy blankets. Only thin sheets or muslins should be used. Or purchase a purpose made wrap. These are shaped for ease of use. It is recommended that you cease swaddling your baby at the age of approximately 1 month. This is due to the increased risk of interfering with mobility and development. Please see video on how to swaddle your baby safely. Yes we can do a link swap. Not quite sure how we do this. Do you mean that I put a link on my site back to you site? or are we just talking about linking blogs? I have found here much useful information for myself. Many thanks to the editors for the info. Hi I would like to link your post to my blog. Is it ok? I have written a post on colicky babies and what you write on swaddling is a perfect complement. If you want to check my blog is: www.whatsbestfor.wordpress.com. Thanks!